North Korea didn’t celebrate Kim Il-sung’s birthday with a nuclear test, although there was never much indication that it would now, and the regime seemed to downplay it. Instead, North Korea soaked up the attention to show the world that it’s making strides in its missile technology. Which is just as bad—if not worse. 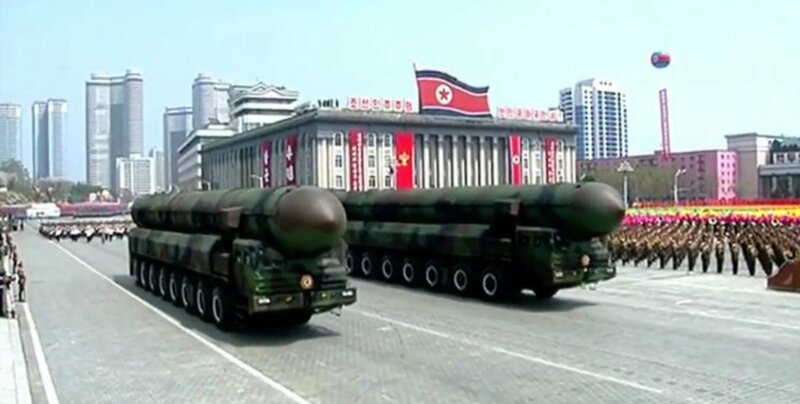 Specifically, during the annual Day of the Sun military parade, North Korea showed off new solid-fuel rocket technology for its medium- and longer-range missiles, which if Pyongyang can perfect, would significantly shorten its rockets’ launch time. This would make the North Korean military more capable of fighting a nuclear war, while sharply increasing the risk of a conflict. North Korea relies on fully- or partially-liquid fueled systems for its longest-range weapons, such as the Taepodong, Masudan and Rodong rockets. Liquid fuel has advantages and disadvantages. What are the advantages? They’re not as complicated to build and the fuel is highly energetic—useful when a rocket is fighting gravity in the boost phase after lifting off. The biggest downside is that liquid fuel is highly corrosive and will eat away at the missiles from the inside out, requiring the North Koreans to fuel them up shortly before launch. Obviously, that’s a distinct disadvantage for the DPRK were a war to break out, let alone a nuclear one which could come down to a matter of minutes. North Korea would have to take pains to hide its missiles the best it could while it fueled them up—while praying that U.S. satellites won’t spot them. That’s not easy, as the logistics behind gassing up a liquid-fuel rocket are extensive. Solid fuel, by contrast, is more stable and built-in with the missile. They’re more technically complicated to make, but more or less ready to fire. That’s why experts are closely studying several launchers on display this year, such as these enclosed missile tubes attached to imported Chinese-made transporter erector launchers. The enclosed tube is to protect a solid-fueled rocket underneath, although obviously we can’t peek inside and take a look. The missiles inside could be prototypes. Another relatively new missile on display is the KN-15—a.k.a. Pukguksong-2—a land-based version of North Korea’s KN-11 submarine-launched ballistic missile, powered by a solid fuel motor. Pyongyang wheeled out the KN-11 for display as well. Worryingly, since solid-fuel rockets are more compact, they’re a good fit for mobile launchers—and the launchers don’t have to stay put for too long since the fuel is contained. That can be quite destabilizing, as it will be harder for the United States, South Korea and Japan to know whether an attack is imminent during a crisis. North Korea is small but mountainous, which limits room to maneuver but gives more places for missiles to hide. Pyongyang can simply stash its missiles inside tunnels or caves, drive them out, aim and fire. “Even if we manage to get through the next few months unscathed, the U.S. and its allies will still be left with a daunting reality: a hostile, unstable foe on the road to greater nuclear strength,” wrote Philip Yun of the Ploughshares Fund, a foundation focused on preventing the spread of nuclear weapons.